The Nokian Hakkapeliitta 5 tire has an interesting history behind just the name alone. The term Hakkapeliitta brings to mind the legendary Finnish warriors and renowned fighters during the middle ages. If you own the Nokia Hakkapeliitta 5 tires you can be sure to have neighbors and friends comment on how impressed they are with your set of tires. Nokian has incorporated Quattrotread, a unique tread pattern that distinguishes these tires. The advantage of Quattrotread is the stability of the vehicle when you drive at highway speeds. An industry first by Nokian Tires, it comprises of four separate rubber compounds. A look at the tire reveals what resembles a bear’s claw surrounded by siping. What it does is to maximize the grip and gives support to the stud during road contact, providing much needed stability especially during braking. The good thing is that in the Nokian Hakkapeliitta 5 the stud does not twist or give way. These snow tires also feature an advanced air wedge tread pattern which gives ultimate control on harsh winter roads. Nokian Tires has also used a new stud positioning as a part of their revolutionary Eco Stud System 4. This means that the sharp end of the hard metal pin always points in the driving direction ensuring a vice-like grip over icy, snowy roads and are far superior to studless tires. The sipe activators on the edge of the tire’s tread pattern enhance the sipes performance on the most slippery of surfaces. Standard winter studded tires may be noisy but the Nokian Hakkapeliitta 5 tires are quiet due to the dampened tire noise. Winter tires are said to save lives due to their safety features and this Nokian is the ultimate when it comes to tire safety. The tire’s tread pattern and components were designed to optimize grip in the most extreme winter conditions. According to Nokian it uses environmentally friendly purified oils while making the tires and ensures that no toxic chemicals are used. The tire also has a useful feature where you can use the tire’s information field to mark the correct inflation pressure. You can even indicate the tire’s place on the car during off-season storage. Another feature is the snow flake symbols in the center of the tread blocks. When the snowflakes start diminishing you know that you need to change your tires soon. A row of numbers displayed on the tires, which Nokian calls the Drive Safety Indicator, shows the remaining tread. With more wear the numbers gradually disappear. Overall, the Nokian Hakkapeliitta 5 is an outstanding winter tire that will get you where you’re going more safely than any all-season or standard snow tire. 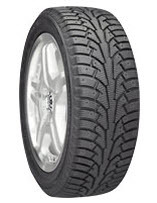 Aside from safety and performance, these Nokian tires come in at a good value for the money. Prices on the Nokian Hakkapeliitta 5 range from around $129 for the 14 inch tires to approximately $173 for the 17 inch series tires. Who Are Nokian Hakkapeliitta 5 Tires Designed For? Nokian has designed the Hakkapeliitta 5 Tires for drivers of coupes, sedans, crossover SUVs, sports cars and minivans who seek performance along with safety in extreme winter conditions. Nokian offers a five-year manufacturer’s warranty against defects in materials and workmanship.